BADBADNOTGOOD was featured on the cover of last Thursday’s NOW. The timing simply couldn’t have been better, since they were playing the Wrongbar the very next day. 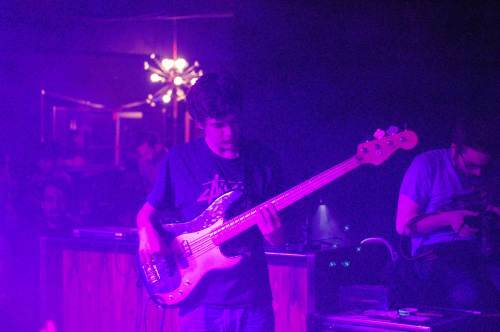 The band consists of drummer Alex Sowinski, bassist Chester Hansen, and keyboardist Matt Tavares. They met at Humber’s jazz program and have managed to fuse elements of jazz, hip hop, youthful bravado, and web 2.0 net savvy to create some kind of tidal wave phenomenon. It was a crazy and adrenaline pumped set as they celebrated both the Now cover, and getting booked for Coachella. After seeing their fresh faces, it would be easy to discount BBNG as newbies. That is, until you hear them play. They are tight and skilled the way jazz musicians are, but they’ve managed to combine that with restless energy and the confidence to dash musical boundaries. Why can’t a band who has figured out how to tie the jazz of yesterday with the hip hop and rock of today put on a show that involves moshing? No reason, because that’s exactly what they are doing. There’s a popular conception that modern jazz has become ossified. It’s easy to get that idea if you listen to standard adult contemporary jazz stations that cater to an older generation that grew up on Miles Davis. If that’s your starting point, then it’s easy to fall into the trap of thinking BBNG are a different breed entirely. If you dig a little deeper though, you realize that mirroring the times, exploring new vistas, and pushing boundaries is exactly what jazz was about. In that respect, BBNG is simply part of the latest wave of artists to pick up the torch. They’ve been able to do it in a way that resonates with a new generation. That’s a good thing for jazz, and a good thing for new music. BADBADNOTGOOD’s next album, BBNG2 is set to release April 3rd.